ADCC, it’s widely known as the Olympics of grappling. BJJ’s most decorated super stars and high-level competitors from all corners of the globe, meet to engage in combat on a truly magnificent stage. It’s a showcase of the grappling arts like no other. With it’s exciting ruleset, and no-nonsense format, it’s easily one of the most entertaining spectacles in our sport. Yuri Simoes is no stranger to the heat of ADCC combat. He’s a two-time champion at ADCC. Claiming titles in 2015 and 2017 in his weight class. Over the course of his career, He’s claimed victories over some of BJJ’s biggest names. He’s carved out a place in BJJ history for himself and will be a force to be reckoned with for years to come. Yuri pursues the take down, unremittingly, and once he achieves position, seems to be stuck to his opponents like an unearthly adhesive. With a unique and energetic passing style, Yuri makes it difficult for his opponents to make sense of what’s coming next. He is known for his crushing and at the same time dynamic top game which he has showcased during his two ADCC titles. Many people have a hard time transitioning from gi to no gi, but this should not be a problem. Although there are very many differences between gi and no gi, there are more similarities. Many people assume that since they do not have access to the lapels, and grips that they may have a hard time becoming accustomed to the gi, although this may be true on rare occasions, many people manage to transition from one to other easily. No gi can be very slippery and being able to find tight ways to pass the guard that don’t allow your opponent to have any space can be a tall order. You will get so close to passing, expend a bunch of energy just to have your opponent retain their guard at the last minute. This is a common occurrence when doing no gi. Not only is it difficult to pass it can also be difficult to solidify a submission, there are not many elements of control so sometimes people can find their way out of triangle, arm bars, and guillotines more so then they might in the gi. Today we are going to take a look at two excellent no gi passes with none other than 2x ADCC champion and IBJJF no gi Black Belt Absolute World Champion, Yuri Simoes. Yuri is arguable the best no gi grappler today. He is able to compete under any ruleset, submission only, points, judges, you name it, Yuri can do and do it well. Without further ado, let’s have a look. This first pass that we are going to be looking at is an excellent option when dealing with somebody who is extremely flexible and playing those pesky new school guards. Yuri is going to focus on isolating his opponent’s legs and controlling their hips. Anytime someone seems to have extreme levels of flexibility they are typically flexible in their hips, hamstring and groins. Being able to nullify their leg and hip mobility is one of the best ways to attack these types of guards. This pass is also an excellent option because of the lack of space. Yuri stays very tight and is able to pass with pressure and solidify the positon. Yuri refers to this position as the “Double Over Pass.” You can see Yuri use this pass very often if you get the chance to watch high lights of him competing at the ADCC or the IBJJF No Gi Worlds. Let’s take a look at the pass below. So as you can see above, Yuri looks to be primarily controlling his opponent’s legs. He makes very good points when he tells us to make sure that our opponent’s knees are stuck together, this is what nullifies their guard and leg movement. What is also very important to note is Yuri’s head placement. 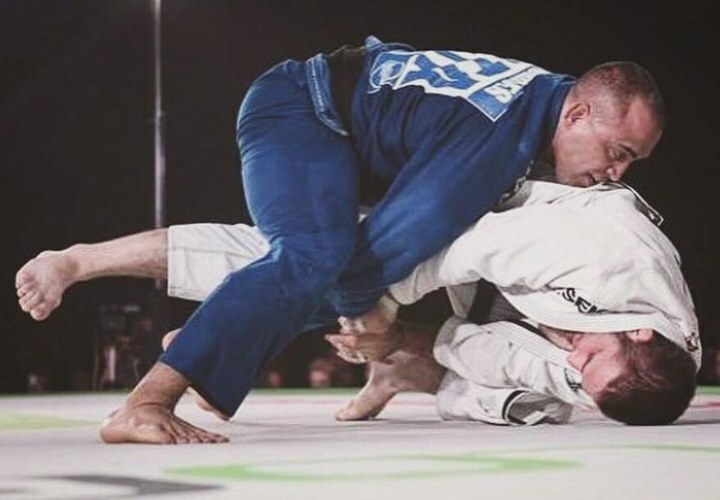 The reason Yuri is keeping his head very low is to avoid being pushed, choked, and he is also using a combination of his head and his shoulders to control his opponent’s hip mobility. Guard is all about being able to have hip movement and distance control. If you can nullify hip movement and close the distance, these are the fundament steps to passing many guards. Obviously there are more elusive guard passing movements that require timing and agility, but the fundament principle behind passing the guard is to control the hips and to close the distance. Even if you apply elusive passing like the Mendes Brothers, eventually to solidify the pass you will have to close the distance. For instance, the leg drag can be timing based but to solidify a leg drag you will eventually close the distance. Let’s take a look at another pass with Yuri. This pass is going to happen by having head control. Controlling the head is one of the best ways to pass your opponent’s guard when training no gi. It can be one of the best ways to maintain control you’re your opponent, keep their mobility limited and ultimately solidify the pass. Yuri has an interesting perspective on this pass and he uses a very methodical approach. This is an interesting pass, especially for Yuri to demonstrate. This is because Yuri has been accused of having some type of wrestling experience countless times. When you watch Yuri compete, one thing really stands out, his wrestling. People have accused him of being a collegiate wrestler or something of the sort several times but Yuri has never wrestled. He said wrestling just makes sense and in this pass he uses a lot of positions that are popular in wrestling and catch wrestling. Let’s have a look. So as you see above Yuri is putting himself into a cradle position from the butterfly guard. He does not initially set up a cradle, his first attempt is to get himself into a guillotine. The guillotine is one of the best submissions and control positions in No Gi. Once Yuri is able to secure the head and arm position, he will proceed to over hook his opponent’s leg, therefore, putting them into the infamous cradle. If you have ever been in a cradle then you have surely felt the misery of being on the receiving end of this position. Yuri will use this cradle to turn his opponent so that they are on their side, once they are on their side, he will start to walk to the side that they are not facing (the side that exposes the back). Once he is able to pass the guard, he keeps pressure so his opponent cannot get both of their shoulders back on the mat and he continues to attack the back. This is an excellent sequence and it is extremely high percentage. This is by far one of Yuri’s favorite places to be, it is safe and it is great to nullify leg locks. When you control the head it is next to impossible for your opponent to start going for your legs. If you want to learn more of Yuri’s no gi game, takedowns, submissions, passes, and more, check out his new DVD set below which is also available ondemand. You will get the content immediately after placing your order. This DVD set will accelerate your no gi game to levels you never thought possible. Yuri just knows stuff that other people don’t and he is capable of relaying information extremely well.